Super Hero Boy: Futeristic stroller! I have a fascination with strollers.. especially those that step outside the lines when it comes to normal stroller design. The Micralite Toro is unlike any other stroller I have tested. It really breaks all the rules as far as typical stroller design goes which really makes it stand out in public. The first thing you might notice if you were to see me pull my Micralite Toro out of the back of my car is that its fold is very unusual. It is what I would consider a full sized, fully loaded stroller which means by nature it should be a fairly large stroller but folded its hard to imagine it that way. The Micralite Toro folds down flatter than any other stroller I have seen in its size class. 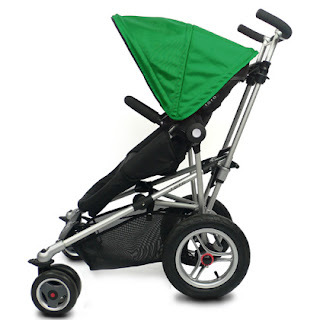 Instead of doing a fold where it breaks at the middle and folds in half like most other strollers in this range it folds flat which has many advantages. I have really started to prefer a larger loaded stroller over a smaller stroller with less options the biggest complaint I have with most bigger strollers is the amount of room they take up both in my house and in my trunk. The Micralite Toro however folds so unusually that it actually takes up less space than some of the smaller strollers I have gotten my hands on. When folded it measures 39.5 x 14 x 17 which means it will pretty much take up the length wise bottom of most trunks but at a mere 14 inches thick when folded, you pretty much have full access to the rest of your trunk. I safely stack my lighter groceries on top of my stroller with no issues as well as anything else that needs to ride home with us, though please note I do not recommend putting heavy items on top of your stroller, and I barely miss the extra trunk space. The other neat thing about the fold is when the stroller is folded it stands upright with no support. The wheels also move freely if the brake is not set so you can wheel your stroller around the house or out to the car without having to unfold it or pick it up. This has to be one of my favorite features about the stroller as I find its so easy to change it between cars or move it in or out of the house this way. Mind you the stroller itself is very light weighing in at 19lbs its not that difficult to pick up or carry but being able to wheel it is a huge plus. Unfolding the Toro is incredibly easy. There is one handle that you squeeze together on the back of the Toro that unfolds the entire stroller and folds it back up. No levers, hooks, buttons to push, nada, just squeeze push and go. I can do it with one hand while holding Connor in my other arm. Once its unfolded you can then adjust the backrest from fully upright (almost a standing position which Connor LOVES) to a fully laid back sleeping position. To adjust the backrest you just squeeze two tabs underneath the handles and it adjusts super easy the best part is that there are no straps to adjust so you can basically adjust your child as your walking. I've gotten so good at it now that I don't even have to break stride to tip Connor forward or back. I've always disliked the old fashioned method of having to undo a strap to lay your child back and the way this stroller adjusts sold me on it our first walk around the block. The stroller will comfortably hold a newborn (with the newborn bassinet or car seat attachment sold separately) to child up to 40lbs. For a newborn the entire seat snaps off leaving just the frame which then squeezes down to form the base to the bassinet attachment. Though we did not get a bassinet to test basically it just snaps into the frame and away you go. I've personally always dreamed of having a stroller with a Bassinet attachment but I've always shyed away as they are just so darn big. The Micralite Toro however is actually smaller sized down for the bassinet than it is as a regular stroller as well as if you add on the car seat adaptor. I can't even imagine how awesome it must be to only have to carry the Toro with you on shopping trips with a newborn. When Connor was still small I brought along this behemoth of a travel system which was impossible to get in and out of my car and actually was so large it made it hard to see where I was going at times. 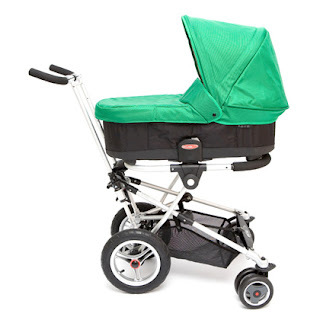 Included with the stroller is the foot muff for cold weather, the air pump for the back tires, and a rain cover. There are additional accessories available as well to add onto your stroller including the newborn carrycot, a set of all terrain wheels for the front of the stroller, a bug shield, and a carrying case. The only downsides to the stroller? Not many but if I had to list some the stroller is very back heavy.. meaning that most of the weight of the stroller rests on the back two wheels so if you have your diaper bag draped over the back of the stroller and you take your child out of the seat the stroller will want to tip backwards if you let go. This is mildly annoying but honestly I counter act that by just throwing my diaper bag in the seat when Connor gets out or just pushing the back end of the stroller against something if we are out shopping or at the park. The other two things are actually "fixed" with add ons so its not so much a lack of design just that the Micralite Toro tries to keep cost down by selling the stroller alone. I really wish that all four wheels were pneumatic , aka air filled, and you can buy a kit to make your stroller "all terrain" by converting the front two wheels to pneumatic wheels. We do a lot of walking on our bumpy street and across the grass at the playground and though the Toro is very easy to push regardless of the terrain I'm curious to see if the pneumatic tires would solve the tipping issue as well as make it more user friendly. The other issue is that I really wish it came with the car seat adaptor instead of having to buy it as an add on. Again that's just another feature we would have liked to explore if it had been included. Otherwise design wise we really love the flat fold, light weight, and Connor adores being able to sit totally upright. It actually gives the stroller almost a "Segway" type appearance which really turns heads. To get your own Toro head on over to Scandinavian Child and check out their store locater or you can pick one up on Amazon! Great looking stroller! I need to try one out for my little Lala, she'd love it! I love Micralite -- aren't they fantastic? We have the FastFold, so I've never seen the Toro, but it looks fabulous. we are doing a giveaway for them right now over on our blog! I love it too!